Part of the 2016 Urban Grey Suppressor-Ready Series, this pistol is clad in urban grey (a mix of grey and FDE). With threaded barrels, high suppressor sights with tritium lamps and extended capacity magazines, our Urban Grey pistols are a direct response to the many requests we get from customers for more suppressor-ready options. 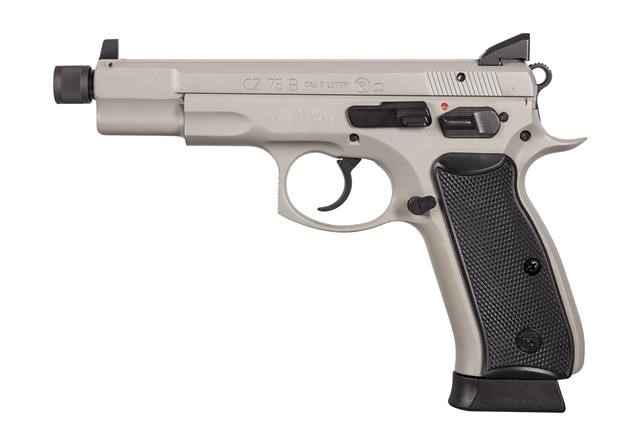 A further evolution of the 75 B O, the new Convertible version allows users to swap from decocker to safety operation in the same manner as the popular P-07/P-09 pistols. Using the same simplified, more robust variation of the 75’s trigger system as the previous Omega, trigger parts use an interlocking design that allows for easy disassembly and reassembly without the need for tools. Not only does this simplify maintenance, the trigger parts themselves are made of different materials to enhance durability, operation life and reliability.